This is lichen of hard, horizontal natural limestone, abundant in places like The Burren but also on limestone tombs in some of the older churchyards. 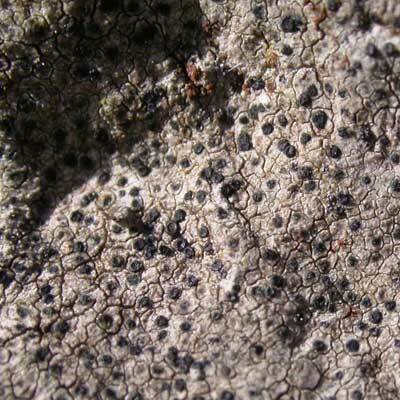 The majority of the thallus — apart from specks of pale grey or fawn-grey, is buried in the rock with only the spherical discs visible (0.3-0.5mm diam.). These have a ‘sucked-in’ apex like little rubber tyres, showing clearly from above. Between the constellations of discs, black dots (pycnidia) may often be seen. Throughout Ireland; rare in the extreme south-east. Discs with distinct sunken apex; hard limestone. Simms, M. J., (2016). Verrucaria dufourii DC.. [In] LichenIreland.